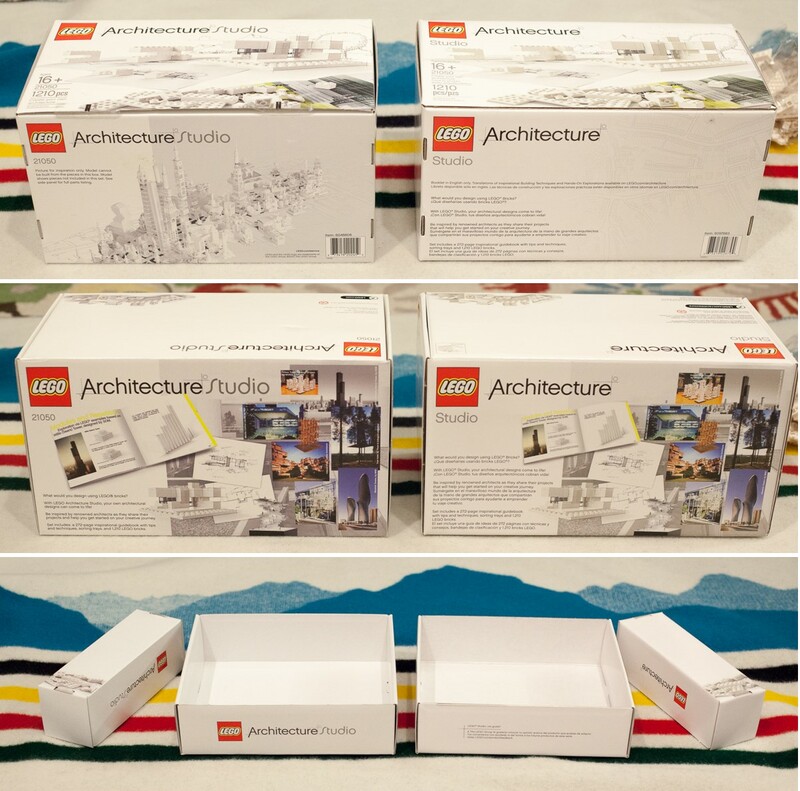 Minor changes in latest 21050 – “Architecture Studio” set. Anyone who has been reading my articles knows that I’m a huge fan of the “Architecture Studio” LEGO set which was released last fall. It’s initial release was in the US only, and it was extremely hard to find near Christmas. It is now available in most countries! 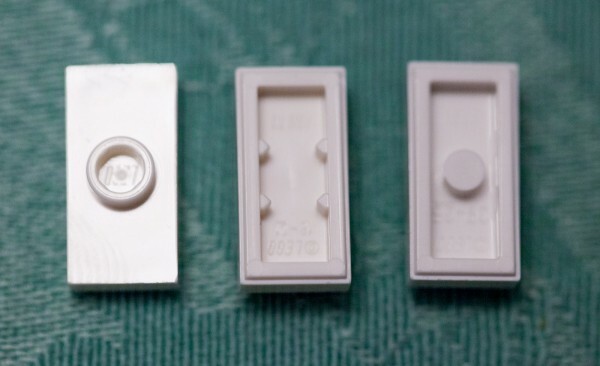 The 2013 box (left) had stronger “Studio” branding whereas the New 2014 box (right) is less prominent. As you will see in many of the photos, the “Studio” part of “Architecture Studio” seems to be downplayed in the typography and branding. This may be to make the product more marketable to a global audience, I don’t know. The contents of the book appear largely unchanged, and the page count is the same. That’s why I was suprised to see a massive difference in the book thickness. The new edition is about 1/3 thinner, which means lower-cost paper or spine. It’s not all bad news, I saw two welcome changes in the new version as well: Inclusion of an orange brick separator + the new revised 1×2 Jumpers. My 2014 set included the new jumper design which is more versatile as it uses notches to allow a 1/2 stud offset without a hollow studded brick. In the Guggenheim Museum in New York, built ten years later, reinforced concrete allowed van der Rohe Frank Lloyd Wright to create new spatial experiences with curvaceous, spiraling shapes. I hope you found this quick review of some of the latest changes interesting… I was surprised to see so many changes in a set which still sells with the same product number: 21050. I’m curious to learn if this type of mid-release adjustments are common. 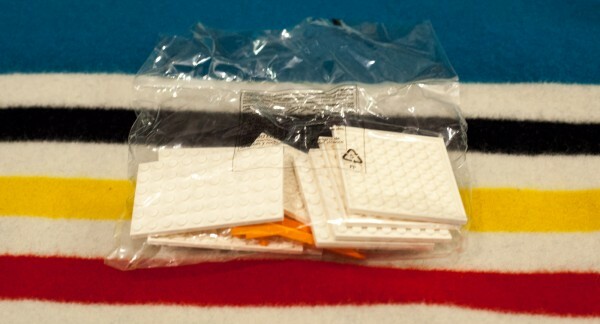 NOTE: You should buy the Architecture Studio from LEGO.com or in your local LEGO-brand store. They have by far the best prices since it’s an exclusive set at this time. Did you notice any other changes in the new version? Please leave a comment below! What’s surprising to me is that I picked up the Studio set this weekend in New York and from this post I realise I have the 2013 set! It’s not a huge deal, as you point out the changes are minimal, though I’m surprised there were any 2013 sets still around considering how hard it was to find! I always wondered if there were any differences between the first and second editions of this set. Thank you for sharing! Is this no longer carried at Barnes & Noble as well?